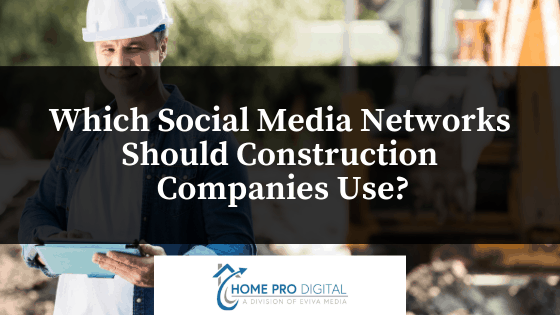 Which Social Media Platform Should Your Construction Company Use? Social media is crucial for construction companies to stay top-of-mind with their customers. It acts as an extension of their referral network and gives them a platform to showcase their expertise and work. If you are a contractor or provide home services, you should read through the tips below to help you design an effective social media marketing plan for your company. If you are new to social media, Facebook is the best social platform to start with. 68% of adults actively use Facebook, making it an ideal way to get your business in front of your potential customer. Facebook provides a platform for you to showcase your work, gather testimonials and recommendations from existing clients, and reach your target market, all in one place. Instagram is the best platform for sharing photos. If you are a general contractor, builder, or provide remodeling services, Instagram is a great platform to showcase before and after photos. For home service providers, take daily progress photos of your current projects or show the behind-the-scenes shots that customers don’t always see. This gives you a chance to become the go-to expert in your industry. If you work on commercial projects or are looking to connect with other professionals, Linkedin is a great platform. You can build both a personal as well as a business profile (similar to Facebook). By using this social networking site, you can connect with fellow construction companies, renowned engineers, and outstanding designers. More importantly, LinkedIn introduces you to high caliber clients like of CEOs, Presidents, and brand managers. Last but not least, Pinterest will help you rank on top of search engine sites. Every click on the photos at Pinterest will lead the browser straight to your company website. This will help generate traffic to your site and will improve your presence in the digital world. You can create pins showcasing your work or latest design ideas. Social Media is a great way to get in front of your target market and showcase your work. Chat with the experts at Home Pro Digital if you want to start implementing a social media strategy for your contracting or construction business. We are a full-service website and marketing agency that specializes in creating websites and marketing strategies specifically for home contractors and remodeling professionals. It’s our job to help your business build a marketing system and develop an online presence that brings in quality leads that help you grow your business. Join 1000’s of home contractors and remodelers who subscribe to our mailing list to get FREE Marketing & Website advice to grow their businesses. Get 31 different Facebook post ideas – More than just project photos!